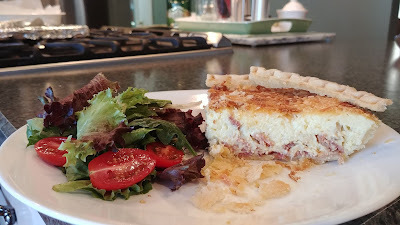 When we can't figure out what to eat for dinner and want something easy, one of our go to meals is quiche with a salad. A few weeks ago we tried Quiche Lorraine from Cook's Country (April/May 2018). But we cheated. We didn't make the crust from scratch. We bought a frozen crust. We'd like to make the crust, but we just had too much going on and had to make some sacrifices. 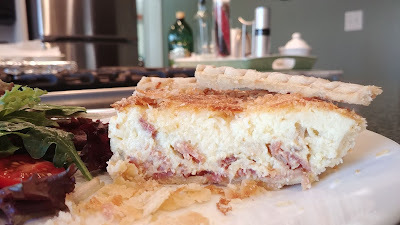 Bacon-Onion-Gruyere - yum. This was a delicious quiche. Next time, we'll make the crust (if we have time!). Cook bacon. Reserve a bit of bacon fat. Set cooked bacon aside. Cook onion in reserved bacon fat until starting to brown. Set aside. Whisk together 1/4 cup cream and cornstarch. Whisk in eggs, remaining cream, salt, pepper until mixture is smooth. 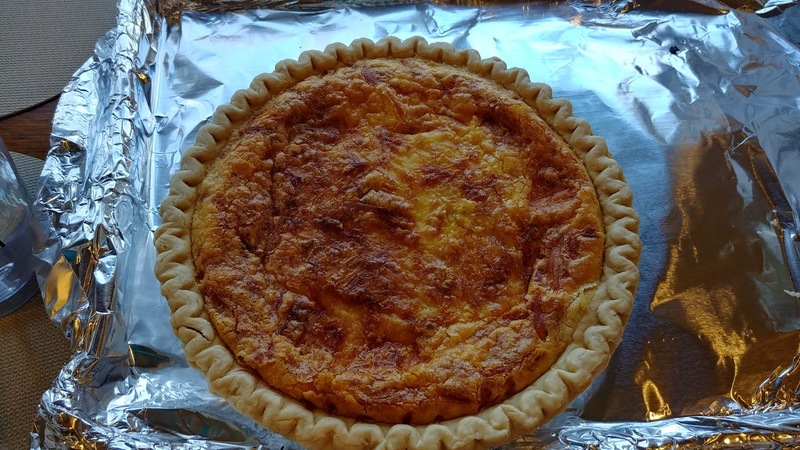 Scatter bacon, onion, and cheese over bottom of crust. Pour egg-cream mixture on top. Bake at 350 for about an hour, until browned on top. Let cool for a bit (they suggest 2 hours; I doubt we waited that long). *Make sure to put your crust on a baking sheet and then fill it. The baking sheet will catch any egg-cream mixture that splooshes out when moving it into the oven.